It’s much better to trial Windows 8 in a dual boot configuration, than to burn your boats with an upgrade of the present operating system. Multibooting of Microsoft systems is flexible, and I cannot think of a combination Windows that you could not try on a test machine. If your computer already runs Vista or Windows 7, or even XP, and you want to multiboot, there is only one factor to worry about, a second drive. 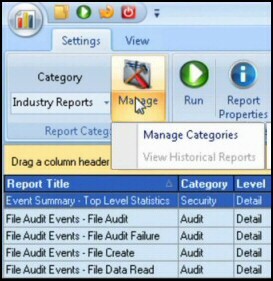 There are other techniques such as ‘Windows 8 to go’ or creating VHDs but I cover those on other pages. A second physical disk is not essential; one disk with two partitions is acceptable for dual booting. Ideally you would have a cleanly formatted 100 GB D:\ drive. However, at a push, you could install Windows 8 on a D:\ drive which already contained some data, providing it had 25 GB of free space. A DVD from which to install your second Microsoft operating system. *If the computer already runs Windows 7 or Vista then no worries, that amount of RAM will be adequate. There is one key procedural difference between a normal install and a dual boot install, watch out for the ‘Custom’ option and then select the second partition. I suggest that before you install Windows 8, you logon to the original OS and give the second partition a label so that you can recognise it (right-click the drive, ‘Rename’). At the very least make a note of the partition’s size so there will be no mistake at point 6 below. Kick off the Windows 8 install from a bootable DVD. If necessary enter the BIOS config and set DVD as the first boot device. Keyboard: USA, or change to a country such as United Kingdom. Upgrade or Custom – This is the key step, select ‘Custom’. N.B. You only get this option if you boot from a DVD. 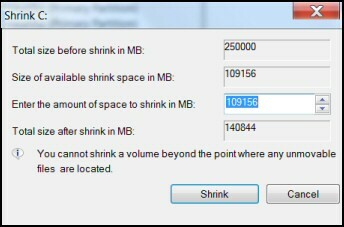 The copying, expanding and installing phases take less than 20 minutes. Towards the end of the process the computer reboots twice automatically. Each time the reboot defaults to the partition with the new operating system. When the Windows 8 install is complete, and you restart once more, you should see a boot screen with the option to choose the previous operating system, or let the timeout countdown and boot in the default Windows 8. After the operating system is ‘born’ you have more decisions to make about initial settings, I choose ‘Custom’ to see all the options, but if you are in a hurry you don’t miss much by choosing ‘Express’. The Windows 8 install completed without my intervention. I was able to logon with my Windows Live ID. I was impressed (and relieved) that Windows 8 found the NIC drivers and connected to my physical network automatically. Naturally, it needed the password for the wireless connection. It’s to be expected that any drivers that you want should be installed on each operating system, but this also applies to applications such as Microsoft Office. Most programs will need to be reinstalled for the Windows 8 operating system; simply copying an old shortcut won’t get your program working properly. In my opinion it’s better to dual boot and then gradually reinstall essential programs, than to upgrade your everyday computer only to find that you cannot revert to the old system when the Windows 8 Preview edition expires. Once the Windows 8 installation completes thus creating a dual boot configuration, then I recommend you inspect the start-up files with BCDEdit or MSConfig. These built-in utilities can adjust the default operating system, and shorten the time the computer waits at the boot loader menu, but do be careful. Dual booting two operating systems on only one drive is more of a masochistic challenge than a serious computing exercise. If youre read my other articles; I do things other techies frown upon, but dual booting on one partition is a step too far. I tried it once, and the operating systems seemed to corrupt one-another. If you only have one huge C: drive all is not lost. While you could use a 3rd party product such as Partition Magic, it’s simpler to use Windows 7’s own Disk Management to shrink the one drive, and thus generate pure free space to create a second disk partition. Mission accomplished. 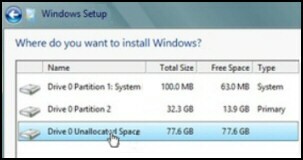 You have free space for a new partition. If you really cannot fashion a dual boot Windows 8 configuration, then think laterally. For instance, do have you an old laptop you could use for a trial installation? A great alternative is to create a virtual hard disk (VHD) from an ISO image. If you have a large capacity USB stick, then ‘Windows to Go’ could cater for your desire to test Windows 8. Could this be time to create a virtual machine on one of your servers using Hyper-V? You could then connect to your Windows 8 installation via Remote Desktop. Once you begin to think laterally it’s surprising you find a way of getting the job done of testing Windows 8. It is not possible to downgrade beta (Preview) versions of Windows 8. However this limitation is not so much of a disadvantage in a side-by-side configuration such as dual boot, you can just boot into the original operating system and delete the Windows 8 Consumer Preview files; I usually just format the partition where the second test system was installed so that I can reuse the space. At first I as perplexed by the Windows 8 log off. 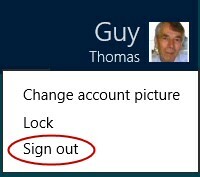 I kept clicking on the Start button, and the Desktop, after going around in circles for longer than I care to admit, eventually I clicked on my username’s icon, and there it was: Sign out! See screenshot right. Once logged off, I found the Windows 8 Shut down power button at the lower right of the main Lock screen. I now find an easier way of shutting down is clicking on the ‘Charms’, selecting ‘Settings’ and so getting to that same Power button. The most important factor when configuring one machine with a choice of operating systems is the belief that it is possible. If your machine already has Vista or Windows 7, the only worry is that you have a second disk partition. The key point during the Windows 8 dual boot is to select ‘Custom’ and choose the correct partition.